Its light straw color offers a fresh bouquet nose of yellow fruit. On the palate, this wine is quite vinous, frank, full and has character and a nervous finish with mineral notes and melting bubbles. Classified a historical monument in 1931, "Les Crayeres" date back to Roman times. Located in the city of Reims, the stones extracted from these caves were used for the fortifications of the city. 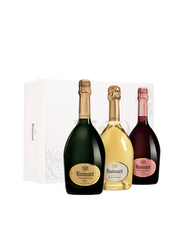 Offering ideal conditions for fermentation and maturation of wine, Ruinart was the first of the great Champagne houses to use them. It was during a trip to the Abbey of Saint-Germain-des-Prés that Dom Thierry Ruinart understood the potential of his native region of Champagne in the development of the famous bubbles. Officially created in 1729 by his nephew Nicolas Ruinart, the prestigious home today continues to flourish through the signature: "The oldest Champagne house." Viticulture :The harvest is manual. Vinification: The Ruinart house uses chalk cellars, called "Crayères" in the winemaking process.